A United Launch Alliance-built rocket is set to take off on July 31 from a launch pad at Cape Canaveral in Florida to bring into space a NASA solar probe, Spaceflight Now reported Friday. The Delta 4-Heavy rocket will lift off in July to carry into space the agency’s Parker Solar Probe designed to collect data in order to help scientists predict solar storms by tracking the flow of energy and heat that speeds up the solar wind. The solar probe, named for scientist Eugene Parker, is expected to reach Venus to perform a flyby on Sept. 28 and arrive at its first perihelion on Nov. 1. The spacecraft is slated to perform six additional Venus flybys to make it closer to the sun by 2025. 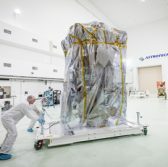 Astrotech will install the heat shield into the solar probe through its Florida-based facility and move the probe to another facility to fill it up with hydrazine propellant. Ground personnel will then link the spacecraft to the Star 48 upper-stage motor before encapsulating the probe into the rocket’s payload fairing structure.